The finalists for the 2016 John W. Campbell Memorial Award for best science fiction novel of the year have been announced. The Campbell Award is a juried award. The current jurors are Gregory Benford, Sheila Finch, Elizabeth Anne Hull, Paul Kincaid, Christopher McKitterick, Pamela Sargent, and Lisa Yaszek. James Gunn has served the jury since its earliest days. 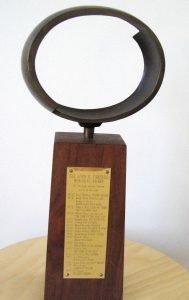 To make it onto the list as a finalist, a book must receive at least one vote from the jury (1st, 2nd, or 3rd place – or, in some cases, Honorable Mention). This year’s Award will be presented on Thursday evening (August 18) during the 2016 WorldCon (MidAmeriCon II) in Kansas City.